By going to The Imperial War Museum. 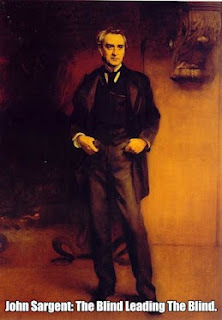 Welcome, today's post we take a look at democracy in the eyes of portrait painter John Singer Sargent. Fiona Graham-Mackay made a visit to The Imperial War Museum again and as an artist has singled out the Gassed painting. She gives her reason why and they are very interesting reasons. One of them is massacre around the world, for example what is happening in Syria and the other reasons are related to how the financial economy works. As you will see the economy has always worked this way, war and massacre has been around for a long time and the pressing questions about Democracy and peace are not as easy to answer as what you might think. 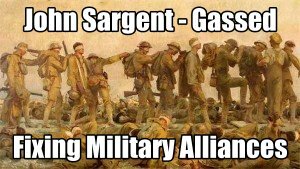 Gassed is simply therefore the blind leading the blind, creativity in essence gives time for us to reflect on todays's problems and artists like John Singer Sargent are best remembered not only for the great paintings but also the methods used to make such interesting works of art. More importantly why art like this is so important part of reflecting any such massacre like the sensitive news from Syria and the difficult problems arising in the world's economy. Syria cries out for an artist because artists paint the truth. It reminds us of the blind leading the blind. World War I and all that. Syria – The Artist Who Tells the Truth through the Eyes of the Blind. Fiona Graham-Mackay writes from London. Power, society, art and politics are cleverly incorporated into today’s shared post. The Imperial War Museum is a hub for information about war and Fiona Mackay incorporates her visit to the Imperial War Museum to explore her thoughts about Democracy. Fiona is an artist writer who in this week’s entry looks at the Massacre that has happened throughout history. Syria is currently reporting many losses of life and for many this type of news is difficult to take on board. Art is one way many people explore the reasons and find comfort in Art. Answer fixing military alliances? Via Stirring Trouble..
John Singer Sergeant is one such famous artist amongst many that draw upon the explanations seen in this week’s article. Please join in the conversation by leaving any comments. If inclined you can also engage in a similar way over on face book. Better still you can follow on Twitter. You can see the recent tweets down below. John Singer Sargent is a famous American portrait painter who learned his craft in Paris here is a portrait painting of him found online. In London you can find his works in the Tate or The National Portrait Museum. Below is a map with the many museums of London. Why not visit today and see what inspiration and other creativity develops in you. The interesting thing about John Singer Sargent is that most of his clientele came from bankers in the late 19th century. He would paint the bankers wives for a reasonable sum of money. His paintings have interesting swirly, gassed backgrounds and he focused on the individual's art rather than the landscape. Sargent is well known for is vigorous brush strokes and perhaps the link is related to his work back then with the boys who were Stirring Trouble Internationally 1890 onwards, who knows?